Dental trauma sometimes causes fractures in the maxillary anterior teeth leading to esthetic, functional and phonetic problems. 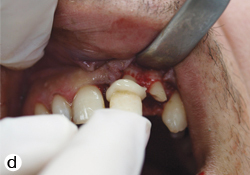 In this report, we describe the treatment of central and lateral incisors simultaneously subgingivally fractured due to dental trauma. Treatment involved flap surgery, reattachment and splinting of the fractured fragments with glass-fibre and composite resin. This reattachment technique, which uses advanced adhesive systems, is an option that offers satisfactory esthetic and functional outcomes. 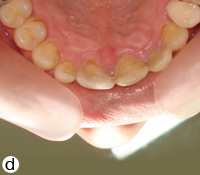 This clinical report describes the treatment of subgingivally fractured central and lateral incisors using a reattachment technique with glass-fibre posts, composite resin and adhesive. A 21-year-old man with traumatized maxillary left central and lateral incisors (teeth 21 and 22) presented to the prosthodontics department of Karadeniz Technical University, faculty of dentistry. Clinical and radiographic examination revealed complex crown fractures, although radiographs did not show the fracture line clearly. The crown fragments were mobile but still in place (Fig.?1a). Fracture lines extended below the gingival level at the palatal surfaces of the teeth (Figs. ?1b, 1c). Treatment options presented to the patient included extraction of the teeth and restoration of the site with an implant-retained crown, post-core and crown, crown buildup restoration with a resin-based composite and reattachment of the tooth fragments. After some deliberation about the advantages and disadvantages of these options, the patient decided on reattachment of the tooth fragments, as he would retain his natural teeth and other options could still be pursued if reattachment failed. Tooth fragments were gently removed (Fig. ?1d) and stored in physiologic saline solution, and the teeth were treated endodontically by conventional methods. A week later, gutta-percha was partly removed with the aid of Gates Glidden burs until 3–4?mm of filling material was left apically to maintain a good seal. It was decided that each crown fragment and glass fibres would be cemented separately ex vivo before attaching them to the root fragments. Figure 1: a) Clinical view of the left central and lateral incisors after trauma. b) Radiographic view after fragments were removed. c)?Clinical view after fragments were removed. d)?Fractured tooth fragments. The crown fragments were etched with 37% phosphoric acid gel (Scotchbond Etchant, 3M ESPE, St. Paul, MN) for 20 seconds, rinsed for 20 seconds and dried with a gentle stream of air. The bonding agent (Adper Single Bond, 3M ESPE), a dual curing luting system (Rely X ARC, 3M ESPE) and fibre posts were sequentially applied according to the manufacturer's instructions using a light-emitting diode device (Mini LED, Satelec Acteon Group, Merignac, France). The lengths of glass-fibre posts (everStickPOST, Stick Tech Ltd., Turku, Finland) needed were measured using a periodontal probe. For each tooth, a hole was drilled in the centre of the original crown fragments using a diamond bur with water cooling to attach the glass-fibre posts (Fig.?2a). The ends of the posts were designed to fit the holes. Clear, filler and solvent-free, light curable Stick resin (Stick Tech Ltd.) needed to wet fibre sheets were brushed over the fibre-reinforced posts. The coronal parts of the fibres were partly luted to the crown fragments by light curing for 40?seconds with the posts seated in the root holes to ensure accurate angulation; each fibre post was also polymerized during this curing period, and then crown fragments were filled with composite resin cement (Fig.?2b). Excess resin was removed and the resin was light cured with LED illumination from multiple directions for 20?seconds. A full-thickness buccolingual mucoperiosteal flap was raised (Fig. ?2c) by making an intrasulcular incision on the facial and lingual surfaces of the fractured teeth as well as half of the surfaces of the adjacent teeth. On direct inspection, we determined that the fracture line did not violate the alveolar bone, and thus osseous recontouring was not needed. The fit of the fractured crown fragments to the roots was evaluated. Using a lentulo filler, the canals of the teeth were filled with a self-adhesive resin cement (Rely X Unicem, 3M ESPE) prepared according to the manufacturer's instructions (Fig.?2d). Fibre posts bonded to the crown fragments were inserted into the canals slowly, paying special attention to fitting the segments properly. When the original positions had been established, excess resin cement was removed with a brush, and the resin was light-cured by LED illumination from multiple directions for 20?seconds, ensuring that no displacement of the fragments occurred before polymerization was complete. Figure 2: a)?A hole was drilled in the centre of each crown fragment. b)?Fibre-reinforced posts were bonded to the teeth fragments. c)?A full-thickness flap was raised. d)?Tooth fragments were reattached with self-adhesive resin cement. The occlusion was evaluated with articulating paper, and margins were properly finished with diamond burs and rubber polishers. 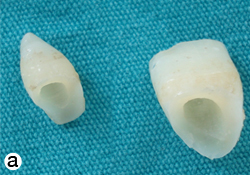 After stabilization of the teeth fragments, the flaps were sutured (Fig.?3a). Radiologic examination immediately after treatment showed a good fit between the fragments and roots (Fig.?3b). A week later, the sutures were removed and clinical examination revealed proper healing (Fig.?3c). A temporary crown for tooth 24 was cemented in place. The fractured teeth were then splinted from the adjacent canine to the opposite right maxillary central tooth with the aid of grooves and fibre-reinforced composite (everStick, Stick Tech Ltd.) (Fig.?3d). Because of the need for mechanical support, a horizontal groove was made in the mid-palatal section of the adjacent teeth (11 and 23) to accommodate the width and thickness of reinforcement material in the middle third of the tooth. Figure 3: a)?Reattached teeth and sutured flap. b)?Radiographic image immediately after reattachment. c)?Frontal view of reattachment after 1 week. d)?Palatal view of the splinted teeth. The required length of fibre to cover two-thirds of the width of the palatal surface of the supporting teeth was measured using dental floss. The fibre was cut to this length, together with its silicone bedding. 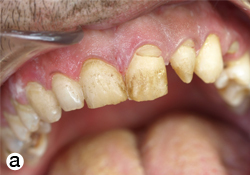 The palatal and proximal surfaces of the adjacent teeth and the fractured teeth were etched with 37% phosphoric acid, then rinsed with water and air dried. Bonding agent (Stick Resin, Stick Tech Ltd.) was applied and light-cured according to the manufacturer's instructions using LED illumination. A thin layer of flowable composite resin (Stick?Flow, Stick Tech Ltd.) was applied to the palatal grooves and proximal surfaces of the adjacent teeth. The prepared fibre was pressed into the resin with the aid of a Stick Stepper hand instrument (Stick Tech Ltd.) to ensure that it was seated in the grooves, and then light-cured from multiple directions for 20?seconds. Diastema between the anterior teeth was bridged and the fibres were entirely covered with composite resin. Finally, to satisfy esthetic requirements, contouring of the restoration was performed with a hybrid composite resin (Filtek Z-250, 3M ESPE) using an incremental technique, and occlusal adjustments were made. The occlusion was evaluated with articulating paper, and premature contacts were eliminated. During all procedures, gingival embrasures were checked by passing dental floss through these areas. Polishing was accomplished using Sof-Lex Finishing and Polishing Discs and Strips (3M ESPE). The patient was warned to protect his restored teeth from any trauma and advised to use dental floss in addition to brushing. 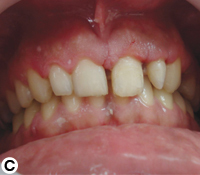 Three weeks later, after gingival healing, the polishing process was repeated, contouring was corrected and tooth number 24 was restored with a metal–porcelain crown. At 18 months follow-up, the restorations were rechecked and polished. Clinical examination revealed a stable, successful reattachment of the fractured crown fragments (Fig.?4). 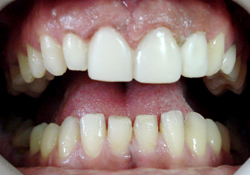 Figure 4: Intraoral view of the patient with polished restorations, 18 months after treatment. In the case described above, restoration of the teeth would necessarily involve the use of a post system, primarily because of the lack of tooth structure coronal to the gingival margin to support the restoration fragment.10 The presence of a ferrule is known to improve the mechanical behaviour of endodontically treated anterior teeth restored with crowns.18,19 Despite the absence of a ferrule in this case, the patient's expectations about reattaching his fractured teeth led us to offer a treatment option using recently advanced adhesive technology. Lanza and colleagues20 stated that glass-fibre posts are compatible with bis-glycidyl methacrylate resin used in bonding procedures, and thus can be bonded to the root canal with adhesive resin cement and new-generation adhesive systems. These adhesive systems disperse stress between the post and the root structure, reducing stress concentration and preventing fracture. Moreover, the bonding of a post to the tooth structure should improve the prognosis for a restored tooth by increasing post retention and reinforcing the tooth structure.11 In previous cases2,5-7,10,11,14,21 fibre posts have been attached to roots and crown together or after cementing a fibre post to the root, a core has been shaped with composite resin and rehabilitated with a porcelain crown or cemented to the natural crown fragment. In contrast, we attached fibre posts to the fractured crown fragments out of the mouth, then cemented these structures to the root fragment. The advantages of this technique were ease of attachment and better fit between the fibre posts and fractured pieces of tooth. Another problem in previous cases has been the need for efficient reattachment of fragments and the use of a post to reinforce this attachment, which is why successful cementation is also critical. To decrease the risk of blood or saliva contamination and improper reattachment, we carried out the cementing procedure after open-flap surgery to permit a visual fit and close attention to reattachment of the fractured pieces. We also used self-adhesive resin cement to join fragments to root parts. This simplified the procedure, as no separate etching or bonding stages were required, and decreased the risk of blood and saliva contamination. When teeth are fractured subgingivally, the fractured crown to residual root ratio will not be reassuring and, despite warnings from clinicians, patients may not pay sufficient attention to care of restorations; thus, an increasing number of affected teeth may require additional reinforcement. For that reason, we splinted the fragments to adjacent teeth with fibres and composite material. Splinting also allowed easy contouring of these teeth with composite resin to improve esthetic appearance and help distribute stress. But the need to splint a fractured tooth to adjacent teeth to increase mechanical resistance against debonding is a disadvantage over an implant option because it necessitates cutting a groove in adjacent teeth. 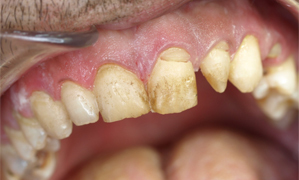 If bonded fragments do not stand the test of time and an implant or other prosthetic rehabilitation becomes necessary, the adjacent teeth will require ongoing maintenance. After 18 months of follow-up, the efficacy of this technique was confirmed by the satisfaction of the patient and the success of the restoration: reattachment, colour stability, apical pathology and periodontal health remained favourable. Although the clinical outcome seemed good, the technique involves many steps and, therefore, considerable expense. For this to become a generally accepted form of treatment for subgingival coronal fractures there would need to be evidence of adequate longevity. Thus, patients should be well informed about possible failures before the treatment. When the conditions and patient expectations meet, as in this case, the technique may be evaluated as a possible long-term solution. However, it should be noted that the success of this technique is related to the clinician's ability and the patient's care. Dr. Bagis is an associate professor in the department of prosthodontics, faculty of dentistry, Karadeniz Technical University, Trabzon, Turkey. Dr. T. Korkmaz is an assistant professor in the department of oral and maxillofacial surgery, faculty of dentistry, Karadeniz Technical University, Trabzon, Turkey. Dr. F.M. Korkmaz is an assistant professor in the department of prosthodontics, faculty of dentistry, Karadeniz Technical University, Trabzon, Turkey. Dr. Durkan is an assistant professor in the department of prosthodontics, faculty of dentistry, Karadeniz Technical University, Trabzon, Turkey. Dr. Pampu is an associate professor in the department of oral and maxillofacial surgery, faculty of dentistry, Karadeniz Technical University, Trabzon, Turkey. 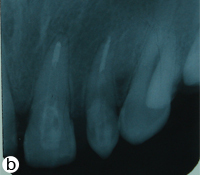 Ertugrul F, Eden E, Ilgenli T. Multidiciplinary treatment of complicated subgingivally fractured permanent central incisors: two case reports. Dent Traumatol. 2008;24(6):e61-6. Yüzügüllü B, Polat O, Ung?r M. Multidisciplinary approach to traumatized teeth: a case report. Dent Traumatol. 2008;24(5):e27-30. Epub 2008 Jun?28. Oz IA, Hayta? 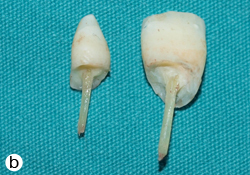 MC, Toroglu MS. Multidisciplinary approach to the rehabilitation of a crown-root fracture with original fragment for immediate esthetics: a case report with 4-year follow-up. Dent Traumatol. 2006;22(1):48-52. Eden E, Yanar SC, S?nmez S. Reattachment of subgingivally fractured central incisor with an open apex. Dent Traumatol. 2007;23(3):184-9. Altun C, Guven G. Combined technique with glass-fibre-reinforced composite post and original fragment in restoration of traumatized anterior teeth — a case report. Dent Traumatol. 2008;24(6):e76-80. Patni P, Jain D, Goel G. A holistic approach to management of fractured teeth fragments: a case report. Oral Surg Oral Med Oral Pathol Oral Radiol Endod. 2010;109(5):e70-4. Durkan RK, Ozel MB, Celik D, Ba?i? B. The restoration of a maxillary central incisor fracture with the original crown fragment using a glass fiber-reinforced post: a clinical report. Dent Traumatol. 2008;24(6):e71-5. Macedo GV, Diaz PI, De O Fernandes CA, Ritter AV. Reattachment of anterior teeth fragments: a conservative approach. J?Esthet Restor Dent. 2008;20(1):5-18,19-20. Yilmaz Y, Zehir C, Eyuboglu O, Belduz N. Evaluation of success in the reattachment of coronal fractures. Dent Traumatol. 2008;24(2):151-8. Oliveira GM, Oliveira GB, Ritter AV. 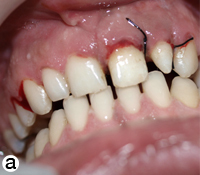 Crown fragment reattachment: report of an extensive case with intra-canal anchorage. Dent Traumatol. 2010;26(2):174-81. Epub 2008 Jan?11. Altun C, T?züm TF, Güven G. Multidisciplinary approach to the rehabilitation of a crown fracture with glass-fibre-reinforced composite: a case report. J?Can Dent Assoc. 2008;74(4):363-6. Andreasen FM, Norén JG, Andreasen JO, Engelhardtsen S, Lindh-Str?mberg U. Long-term survival of fragment bonding in the treatment of fractured crowns: a multicenter clinical study. Quintessence Int. 1995;26(10):669-81. Bagis B, Durkan R. Restoration of a fractured tooth with dental glass fiber and composite crown: a case report. Internet J Dent Sci. 2007;5(2):1-11. Valceanu AS, Stratul SI. Multidisciplinary approach of complicated crown fractures of both superior central incisors: a case report. Dent Traumatol. 2008;24(4):482-6. Kocadereli I, Ta?man F, Güner SB. Combined endodontic-orthodontic and prosthodontic treatment of fractured teeth. Case report. Aust Dent?J. 1998;43(1):28-31. Naudi AB, Fung DE. Tooth fragment reattachment in multiple complicated permanent incisor crown-root fractures - a report of two cases. Dent Traumatol. 2008;24(2):248-52.
van Dijken JW, Sj?str?m S, Wing K. The effect of different types of composite resin fillings on marginal gingiva. J?Clin Periodontol. 1987;14(4):185-9.
da Silva NR, Raposo LH, Versluis A, Fernandes-Neto AJ, Soares CJ. The effect of post, core, crown type, and ferrule presence on the biomechanical behavior of endodontically treated bovine anterior teeth. J?Prosthet Dent. 2010;104(5):306-17. Lima AF, Spazzin AO, Galafassi D, Correr-Sobrinho L, Carlini-Júnior B. Influence of ferrule preparation with or without glass fiber post on fracture resistance of endodontically treated teeth. J?Appl Oral Sci. 2010;18(4):360-3. Lanza A, Aversa R, Rengo S, Apicella D, Apicella A. 3D FEA of cemented steel, glass and carbon posts in a maxillary incisor. Dent Mater. 2005;21(8)709-15. Turker SB, Sener DI. Replacement of a maxillary central incisor using a polyethylene fiber-reinforced composite resin fixed partial denture: a clinical report. J?Prosthet Dent. 2008;100(4):254-8.